A gun safe is necessary for anyone who has guns. You don’t want them stolen or landing in the hands of kids. If you are on a budget of 1500, you’ll find some of your best options below. The best gun safe under 1500 dollars partly depends on your needs. We have ranked the gun safes based on security, convenience, and durability. 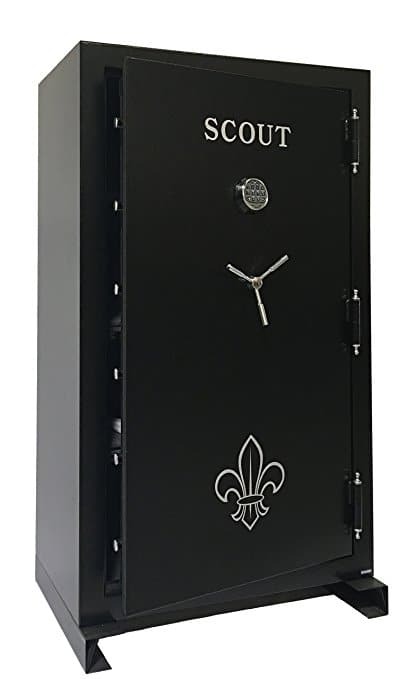 The Scout UL RSC Certified Gun Safe is the best gun safe under 1500 dollars with a UL lock. This programmable digital lock is secure. For extra security, the safe features a drill-resistant hard plate to protect it from drill attacks. The safe is fireproof at 1,400 degrees Fahrenheit for 60 minutes. Although it’s a large safe, you can store small guns in the handgun pockets on the door organizer. It has additional pockets on the door organizer for storing other items too. Door organizer with handgun pockets. Fireproof at 1,400 degrees Fahrenheit for 60 minutes. 70″ x 42″ x 24″. 10 x 1.5″ diameter moving locking bolts. 6 x 1.5″ diameter dead bolts. Has a door organizer that can store handguns. 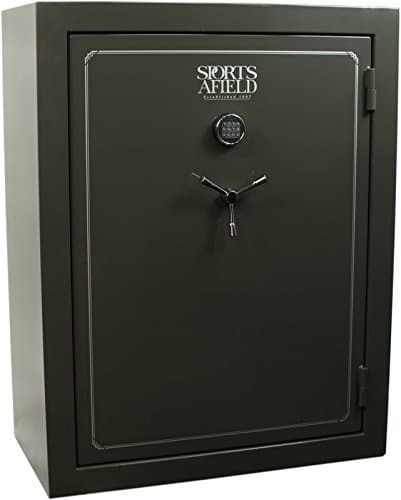 The Sports Afield Standard Series is the best gun safe under 1500 dollars that features a theft alert audio alarm. It also comes with a lifetime warranty. The warranty protects against natural floods, fires, and theft. Its fire rating is 40 minutes at 1,200 degrees Fahrenheit. 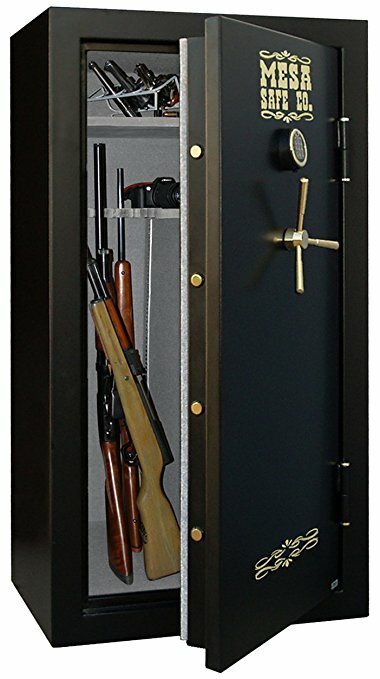 This gun safe features adjustable shelves, standard door organization, and override keys. It also has a built-in AC power port. The programmable electronic lock is illuminated, so you can see it in the dark. 59″ x 46″ x 25″. Fire-resistant at 1,200 degrees Fahrenheit for 40 minutes. Has a standard door organizer kit. You can store handguns in the door organizer kit. The Tracker Safe TS64 features a UL electronic lock and adjustable shelves. It has a drill-resistant hard plate to stop drill attacks. The Tracker Safe TS64 Fire Insulated Gun Safe also has attack-resistant external hinges. You can open the door up to 200 degrees. Another security feature of the safe is the re-locker pin that helps protect against lock tampering. The safe is fire-resistant at 1,200 degrees Fahrenheit for 30 minutes. Fire resistance of 30 minutes at 1,200 degrees Fahrenheit. Grey textured powder coat finish. The Mutual Fireproof Gun Safe has a UL lock and a fire activated expanding door seal. It has a drill-resistant hard plate to stop drill attacks. The safe also features a spring loaded re-locking system for additional security against thieves. Its battery is located outside the safe door, making it easy for you to change the battery. When the wrong code is entered, the safe has a penalty lock-out period. The safe comes with a manager code that you can use to delete or change the regular user code. Manager code to delete or change the regular user code. Fire activated expanding door seal. Ability to change the code. The lock has a penalty lock-out period when the wrong code is entered. 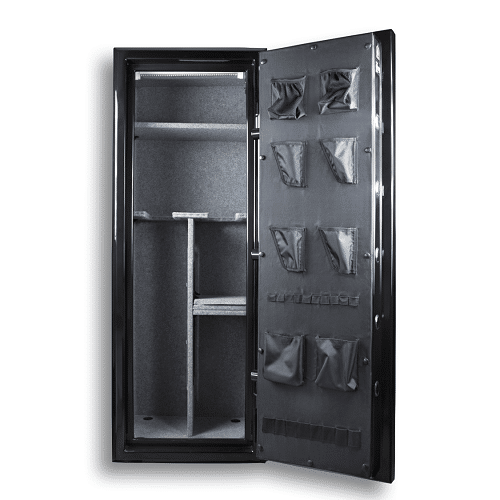 The Kodiak Strong Box Gun Safe is the lightest safe on this list at 485 lbs. It features a swing out gun rack and a deluxe door organizer. The safe has a gun capacity of 20 long guns and four handguns. Its fire resistance rating is 60 minutes at 1,400 degrees Fahrenheit. The heat activated door seal expands up to seven times its size to block smoke and heat. For protection against thieves, the gun safe has a drill-resistant hard plate and a spring loaded re-locker. 59″H x 28″W x 20″D. Gun capacity of 20 long guns and four handguns. Fire resistance rating of 60 minutes at 1,400 degrees. Lightweight in comparison to other similar gun safes. Smaller gun capacity than some other gun safes. 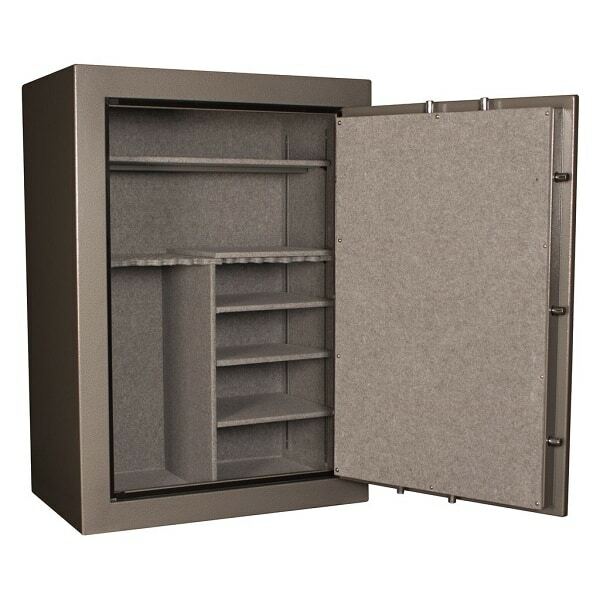 The Mesa Safe Company Rifle Gun Safe has a fully upholstered interior. It is made of steel with an overall thickness of 1 1/2″. It has a fire resistance rating of 60 minutes at 1,750 degrees Fahrenheit. The Mesa Safe Company Rifle Gun Safe is the best gun safe under 1500 for fire resistance. This gun safe is battery-operated, making it more convenient. The safe has a punch activated spring loaded re-locking device for extra security. Four anchor holes that you can use to secure the safe to the floor. Fire resistance rating of 60 minutes at 1,750 degrees Fahrenheit. Punch activated spring loaded re-locking device. You can mount it to the floor. Some customers said the lock didn’t work well. The gun safes listed above are some of the best under 1500 dollars to buy in 2018. They have great security features to prevent your weapons from landing in the wrong hands. Most of them have fire resistance to protect your guns in a fire. 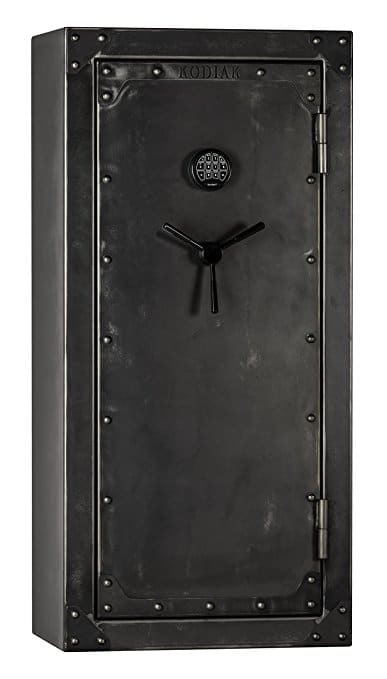 Which do you think is the best gun safe under 1500 dollars? Hey Buddy!, I found this information for you: "Reviewing the 6 Best Gun Safes under 00 in 2018". Here is the website link: https://thegunrights.com/best-gun-safe-under-1500/. Thank you.